When going to Walt Disney World, the best way to experience little extras is to stay at one of the resorts on the property. They offer additional park hours for guests as well as plenty of fun within the resorts. Getting to and from a Walt Disney World resort is easy and convenient with the Magical Express. 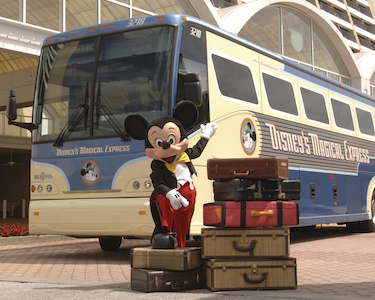 When you make your reservation at one of the many (and different) resorts at WDW, make sure you add the complimentary Magical Express to your plans. They will mail you luggage tags that identify your bags as going to a specific WDW resort. Once you land at Orlando, you have two choices. You can either collect your luggage yourself and take them to the Magical Express gateway, or you can simply go directly to the Magical Express and let the airport staff collect your bags and send them to your resort. If you don’t collect your own bags, your luggage will eventually make their way to your hotel room while you are out enjoying the parks. Although, if you arrive later in the evening, you would probably benefit from collecting your own luggage as sometimes it takes several hours for your bags to make it to your resort. Once you are on the Magical Express, sit back and let the driver take you to your resort without all the hassles of dealing with a taxi or the city traffic. Sit back, watch the video, and soon you’ll be registering at your resort, ready to take in all the sights and sounds of Walt Disney World. When you are ready to return home, the folks at the Magical Express will print your boarding pass and take your luggage. All you have to do is to board the bus and in about a half hour you’ll be at the airport. Your luggage will arrive separately but will be tagged to your flight so they will fly with you. To make sure you make it to your flight on time and to assure your luggage makes it onto your flight (because they go by a separate truck), your reservations on the Magical Express are usually set for three hours before your flight time. But there are plenty of stores and restaurants at the Orlando airport to occupy your time if you have some last minute gifts to purchase. Whatever you do, when you stay at a WDW resort, by all means take advantage of the Magical Express. Roy Brokaw writes about interesting things to do and places to see. He is also an accomplished travel photographer. « What’s new and coming to Walt Disney World? Plenty! ← What’s new and coming to Walt Disney World? Plenty!